A post by Hadley Dynak, who captured our pilot cooking class at McPolin elementary school on Friday, April 8th, 2014. To view on Hadley’s blog, click here. It’s Friday afternoon in early April in Park City, Utah. The sun is shining, and the hope of spring abounds, despite the surrounding snowcapped hills and the brisk chill that makes you quickly zip up your coat and run inside to get warm. At McPolin Elementary, many of the kids have already gone home for the weekend. But a few are still around participating in an after-school program sponsored by the Park City School District and Holy Cross Ministries. For nearly 15 years, these two groups have partnered to provide academic support and enrichment activities to local elementary students. It’s the perfect place to pilot a new cooking class created by the team behind EATS (Eat Awesome Things at School). 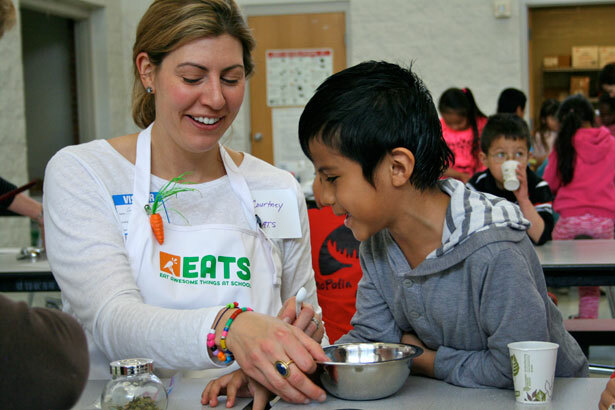 EATS focuses on enhancing the school lunch program in Park City — providing kids with opportunities to try new healthy eating options, and fueling conversation in the larger community about the choices we all make about our food. 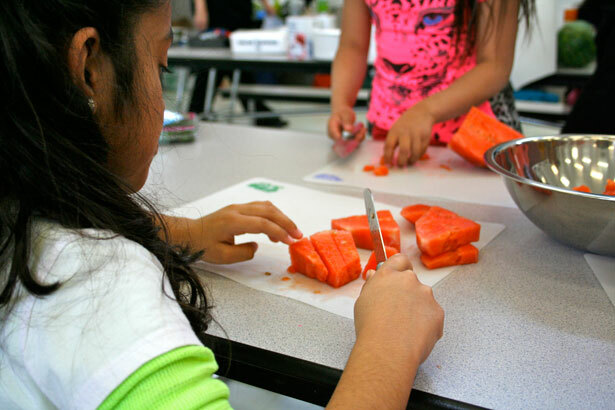 Its a newish effort, and one backed by a group of dedicated volunteers who today are coming together to teach Kindergarten-5th graders how to make black bean burgers and watermelon, jicama, and cucumber salad. We’re in the multipurpose room at the school that serves as the cafeteria, gymnasium, auditorium, and gathering space. Right now it’s a learning laboratory for chopping, dicing, smelling, stirring, and tasting. The youngest group comes in first with much enthusiasm and energy for the experience they are about to have. Many have never used a knife before, though most have used a peeler or a masher. All are game to roll up their sleeves and get to work. And when questions like, “Who wants to measure” are called out, many raise their hands and shout, “Me!”. A group of ten Ecker Hill Middle Schoolers, all wearing blue track jackets emblematic of the youth leadership group, Latinos in Action, stop by to help out and immediately get in on the action. Together the kids focus carefully on the tasks at hand—peeling the cucumber (using long strokes away from your body), mashing the black beans, picking apart the mint, cilantro and basil, and squeezing the lime. They crack eggs, dice watermelon, form patties using an ice cream scoop, and plate up the burgers with a garnish of salsa, ketchup, watercress, and mayo. “OOOO.” “Yum.” “I like cooking!” are the general refrains. Of course there are a few who politely take off the black bean burger from the bun and eat only the bread or who offer their tasting to someone else. But their focus and intent on the cooking experience builds not only a greater understanding of what they put in their body, but an appreciation of what it means to prepare food and share it with one another. It’s true hands-on learning that carries forth beyond the school and into family life—accompanied by the recipes (written in both English and Spanish) of what the kids made. The research findings on the benefits of family mealtime are significant. While some studies suggest that it is difficult to isolate these benefits from other factors that define family life, there is evidence that children who eat with their families tend to try healthier foods, have less depressive symptoms, higher academic achievement, and improved well-being. 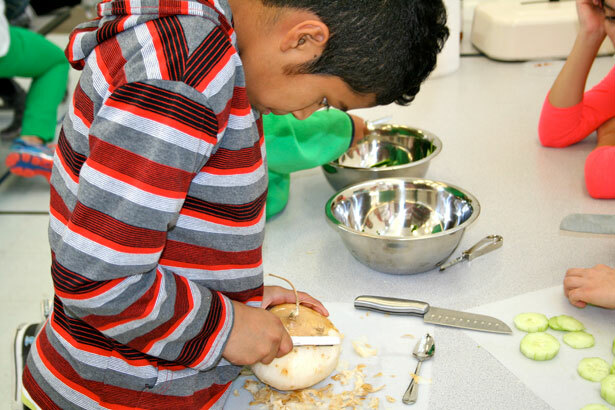 The EATS cooking class itself may not directly lead to more family meals, but engaging young people in the process of cooking and eating together builds their interest and practical skills, exposes them to new foods, and creates a gateway to the family table. The McPolin pilot includes two sessions with the second scheduled for May 9th. If all goes according to plan, these will be the first of many, and there is hope to expand and offer similar programming at the other district elementary schools. Thanks to Fairweather Foods, McDowell Farm, Wilkerson Farm, Whole Foods Market, Holy Cross Ministries, and the Park City School District for their interest in making the project possible. And a special thanks to the staff and volunteers of EATS for driving forward opportunities for Park City kids to appreciate food through cooking. And then sitting down with them to eat. For more photos of the McPolin pilot cooking class visit the Flickr set here.